The Faraday Future FF 91 set a new production EV record at Pikes Peak, beating the Tesla Model S by over 20 seconds. Electric start-up Faraday Future has been trying to persuade us that the self-driving FF 91 is a Tesla killer. When it was first revealed at the CES show earlier this year, it was declared as the fastest accelerating EV in the world. 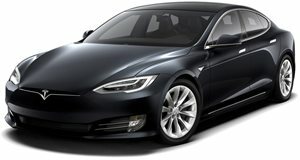 Faster, even, than its arch rival: the Tesla Model S. Of course, it didn’t take long for Tesla to reclaim that record. Thanks to Ludicrous Plus mode, the Tesla Model S soon beat the FF 91’s 0-60 mph time before it had even started production. Now, Faraday is fighting back as the EV has beaten another one of Tesla’s records. The FF 91 was recently let loose at the gruelling Pikes Peak hill climb, in what was the ultimate test of the EV’s capabilities. Last year, Tesla set a record for a production EV at Pikes Peak with a time of 11 minutes and 48 seconds. The FF 91 destroyed that time by 23 seconds, completing the 12.42-mile circuit in 11 minutes and 25 seconds which set a new production EV record. And before you argue that the FF 91 isn’t a production car since the Nevada factory still isn’t ready, its hardware and softwarewasproduction ready. "Our real-world testing program is designed to find problems that we would never find in a controlled environment," said Pete Savagian, Vice President of Powertrain & Battery Systems. “We’re proud of our time, but this is about the quality of our propulsion system more than just a one-time race. Our focus was on repeatability - to reach the peak without overheating the vehicle, and to be able to do so again and again.” Faraday says that the FF 91’s record Pikes Peak run will also help the production model. "We were able to identify key battery pack relay and system seal issues that will directly result in improvements in the production process," said Faraday’s principal engineer Robin Shute, who also drove the EV to victory at the hill climb. If the FF 91 makes it to production, it will allegedly offer 1,050-hp and a 0-60 time of 2.39 seconds. Its 130-kWh battery should provide a range of 378 miles.